Want a stronger bench? Sure you do. This powerful 1-2-3 approach points you toward the awesome goal of doubling your current load. Believe it! Does increasing your bench press by a factor of two seem like a crazy goal? If you happen to be a benching god like Ryan Kennelly (2008 world-record for 1,075-pounds with bench shirt) or Kirill Sarychev (2015 "raw" record of 739 pounds), you're in a class all your own. But if you're a mere mortal who's has been at it for a year or so, keep reading. "Double (Yes, Double!) Your Bench Press" is no clickbait or empty promise. Featuring EAS Myoplex Athlete and active-duty Coast Guard member Steven Lopez, this is a real plan to help you double your real one-rep bench max. Every journey has a starting point and an end point. Your starting point here is your one-rep max on the bench. If you don't know your 1RM, here are two ways to determine it. Method 1: Enlist the help of an experienced spotter. Warm-up gradually, doing a handful of very light sets to increase the blood flow and prepare the muscles for what's to come. Now, start adding more weight. If, for instance, you think your one-rep max is about 225 pounds, start with 135 for 3 reps, then 165 for 2, then 195 for 1, and finally 225 for 1. If you reached 225 without a struggle, add five or ten pounds and see if you reach your max. If not, keep gradually adding weight until you do. Method No. 2: Start by figuring out your 10-rep max: the weight you can lift for 10 bench-press reps and no more. Plug that weight into our One-Rep Max Calculator. Voila! The figure you get from the calculator won't be perfect, but it will be close. If, for example, the calculator gives you a figure of 220 pounds, your goal is to lift 440 pounds. Does that blow your mind, or what? It's an awesome goal, but you won't get there overnight. The trick is to set some aggressive but realistic milestones to guide you on your way. "If you're a beginner, using proper techniques, you can expect to see your bench numbers go up by as much as 50-100 pounds within the first 12 weeks," says Lopez. "If you've been lifting for a few years and have good form, you're looking at less of a bump—maybe 30-50 pounds." Use these numbers as you build your milestones. There's a training concept called "specificity"; meaning, if you want to get better at a specific physical activity, then perform that specific activity. If your goal is to be a better bencher, then do bench presses. It's that simple. "You should bench three days per week," Lopez says. "For instance, Monday could be your heavy day, Wednesday your light day, and Friday another heavy day." After you finish the pyramid, add at least two shoulder, three upper-back, and two triceps exercises—4 sets apiece, plus one warm-up each. "Your goal with these additional exercises isn't to go to failure, but to move heavy weight with proper form, keeping your reps around 3-5 for each working set and 7-10 for your warm-up set," says Lopez. Maintain specificity by following your bench presses with chest movements and front delt, triceps, and lat builders. Rotate among the best presses and flyes, including incline, flat-bench, and decline machines, dumbbell and barbell presses, and weighted dips—up to 12 sets total of these various movements. Doing these ancillary exercises after your benches will help you progress to your bench-press goal. The Standard for Peak Performance and Promoting Muscle Growth! Go Now! If you're going to build a monster bench, you need to eat like you're in offseason mass-gain mode. "To get a rough estimate of how much you should eat," Lopez says, "multiply your body weight by 18 to get your total calories-per-day goal. Then, monitor what you're eating and how your body is responding so you can make changes over time." Lopez advises people to consume a daily minimum of 1-1.25 grams of protein per pound of lean body weight. Use a standard macronutrient breakdown of 40 percent protein, 40 percent carbs, and 20 percent fat to determine where your total calories should come from. You're Good to Go. Now Go! "Stay with your program as long as it's delivering results, which you'll see by monitoring your strength improvements," says Lopez. "Tweak your routine so it doesn't get stale; otherwise, keep at it unless you stop seeing gains altogether." If you aren't progressing, Lopez says, assess where you are having the most issues. Maybe you can't lock out your elbows and finish your heaviest presses. If so, he says, try reverse band presses or floor presses with dumbbells. Or do Smith presses, adjusting the safeties to work the upper end of your range of motion. Partial reps and negatives using a power rack with safety pins can also help you overcome sticking points that stand between you and your goal. 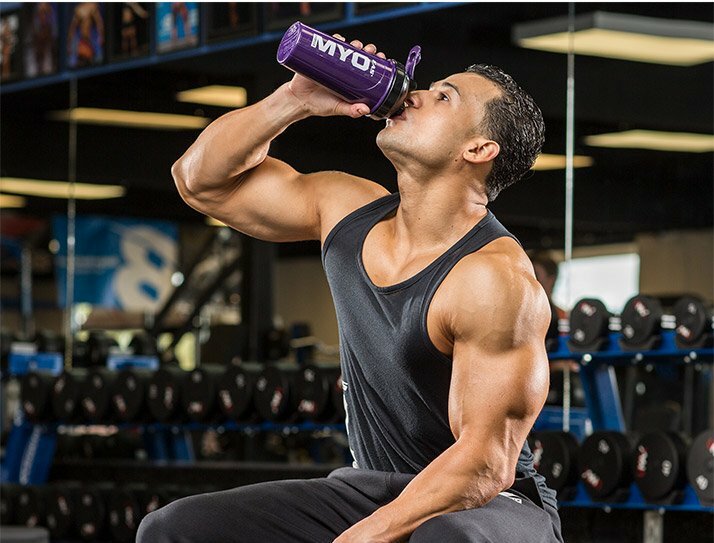 Shop EAS Myoplex Products In Our Store!